Pancakes are like fluffy canvases, and with so many chefs leaving their mark on the griddled wonders, navigating the city’s pancake scene can be overwhelming. We found four to satisfy any craving. Now go forth and crush some stacks. 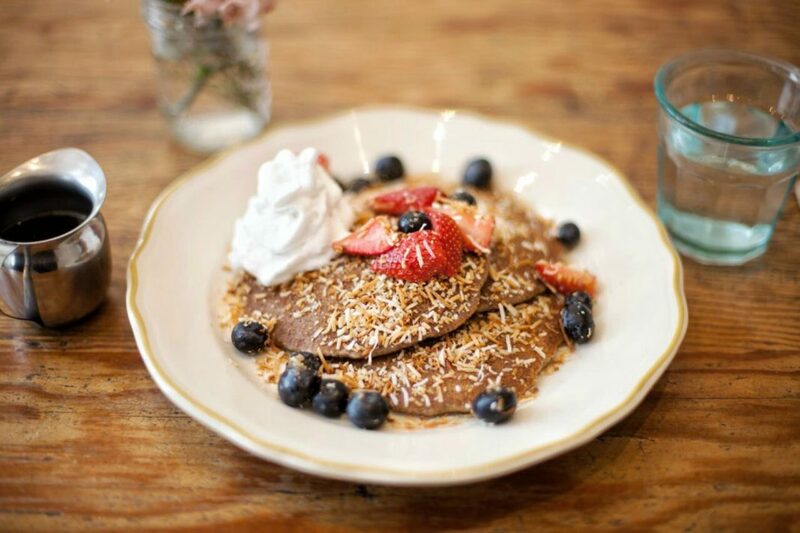 Terms like “vegan” and “gluten-free” can be a pancake’s worst enemy, but that’s not the case at this quaint brunch spot. Made from oat, buckwheat, and corn flour, the House Pancakes have a springy texture ideal for soaking up syrup. Or try them with fresh fruit and coconut flakes. 5904 N. Figueroa St., Highland Park, kitchenmousela.com. It’s rare something so simple blows your mind, but the airy Ricotta Hotcakes at this Aussie-style café do just that. The batter is whipped with fresh cheese, resulting in freckled cakes that are exceedingly moist. Served in threes, they’re finished with sliced bananas and a pat of honeycomb butter. 109 Santa Monica Blvd., Santa Monica, rubyscafe.com. Purists can find bliss at the Salt’s Cure WeHo spin-off, where the menu is built around the restaurant’s famed oatmeal griddle cakes. The Toasted Cinnamon Sugar variety is most basic, but there are also fancy toppings like sweet Pink Lady apples. 7494 Santa Monica Blvd., West Hollywood, breakfastbysaltscure.com. Blur the line between breakfast and dessert at this stalwart diner. Studded with coconut, pecans, and butterscotch chips, the Scotch on the Rocks pancakes evoke the magic of a seven-layer bar. Each hubcap-size order comes covered in powdered sugar and a small mountain of whipped cream. 7916 Sunset Blvd., West Hollywood, thegriddlecafe.com. Previous articleWhere to Find the Prettiest Pendant Lighting in L.A.